By personalising content on websites you provide me with content that is likely to be relevent to me. And that saves me time. It tends to make me think that you have your act together. That you are competent and possibly sophisticated in your use of data and technology. Because of your personalisation, you make it that much more likely that I will purchase from you. When you send me direct mail then it may or may not be personalised. Simply putting my name on it does not constitute personalisation. Doing that and taking my situation and/or my past behaviour into account when you talk to me in your direct mail does constitute personalisation. And by personalising your direct mail to me it is that much more likely that I am going to read it. Whether I act on it or not depends largely on your timing – did your personalised direct mail catch me when I have the need for what you are offering? The big issues with personalisation as it is practiced is that it addresses the rational / functional needs. I’d argue that the kind of personalisation that I have described is a hygiene factor. The thing about hygiene factors is that if they are present they do not build positive emotion, engagement or loyalty. When hygiene factors are not present then they do build dissatisfaction. Customers are people – human beings. For most human beings there is nothing more nourishing than the personal touch. The personal touch is always a human to human encounter. It is one human being taking the time to acknowledge, validate and uplift another human being emotionally. I can talk about this in many ways and sometimes an example is much more direct and useful. Please take a look at the image below. Now the interesting thing is that this sentence would not have had the same impact if it had been typed up. It occurs as personal because it is handwritten and it lands as authentic – as heartfelt. The net impact of this personal touch is that RocketSurgery is imprinted on my mind (and heart) and next time I am choosing between ANother or RocketSurgery, I know who will get my business. So what is the lesson we can take away from this? Personalisation is necessary because it delivers on the functional (hygiene) need. Yet it is not enough to build an emotional connection with your customers and grow loyalty. To do that you have to be personal: leaving your customer feeling acknowledged and valued at an emotional level. Author Maz IqbalPosted on March 24, 2011 March 24, 2011 Categories Case Studies, Customer Experience, Customer Insight (inc VoC), Customer Strategy, MarketingTags customer, direct mail, emotional connection, emotional impact, human, human touch, loyalty, personal, personalisation, personalization, persuasion, website, Yes! 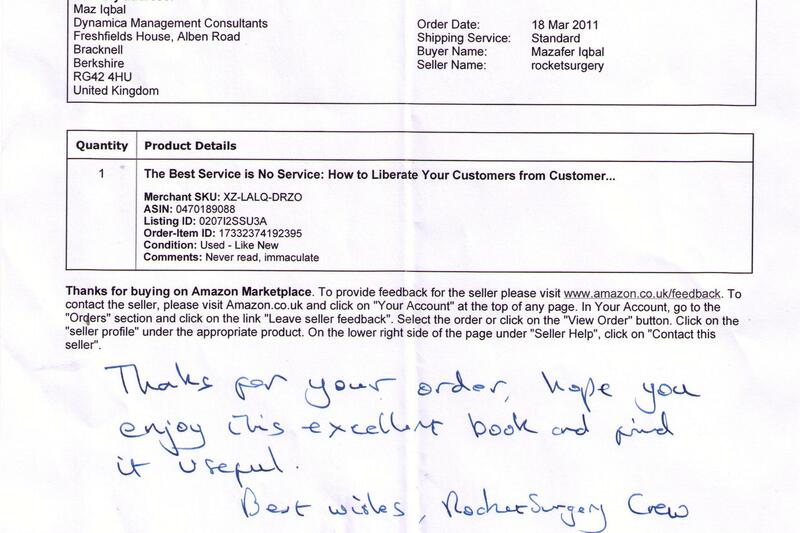 Maz — I found and printed your blog posting while researching materials for my 2nd book (on Customer Happiness), and just read it today … and was very pleased to see that you had ordered my 1st book via Amazon Marketplace, and were commenting on the hand-written note by the seller! Sorry that I can’t send a personal hand-written note, too, but I also hope that you enjoy the book … and maybe we can exchange further ideas on customer happiness and experience! Previous Previous post: Santander – the worst bank in the UK, really? Next Next post: Does marketing deserve a seat at the Customer Experience and Customer Centricity tables?